The players draft for the fourth edition of the HBL Pakistan Super League was held on 20 November 2018 in Islamabad where teams reshuffled their squads and brought in new local and overseas talent. 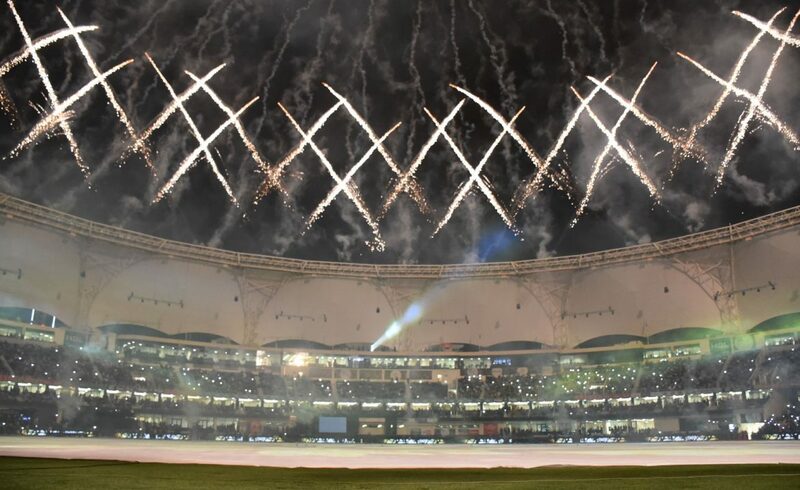 A number of star faces have joined the PSL 2019 for the first time, whereas many players have also moved to new franchises. Here, we take a look at the biggest movers and shakers from the draft. AB de Villiers, the dashing batsman from South Africa, will make his maiden appearance in the HBL Pakistan Super League. Without any surprise, he was the first pick in the draft when Lahore Qalandars pocketed him from the Platinum category. 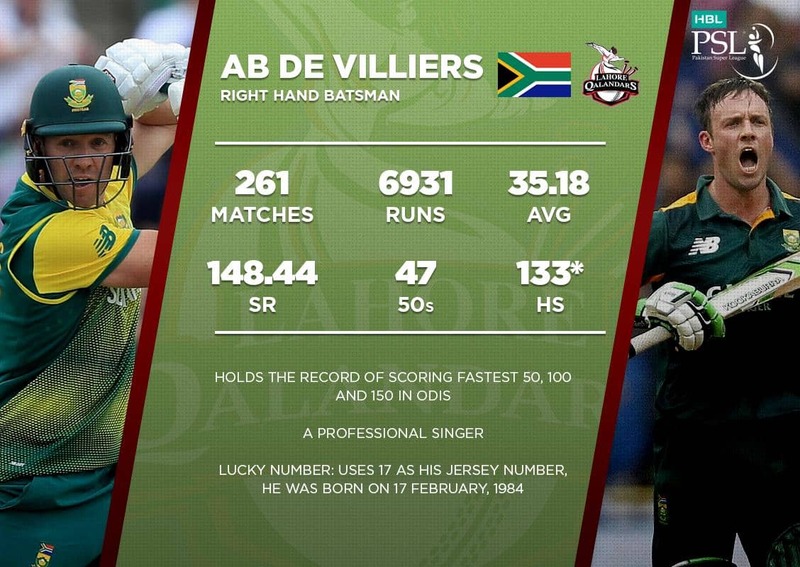 De Villiers, who holds the record for the fastest 50 and 100 in ODI cricket, and has been extremely popular in the T20 leagues all over the world. The 34-years-old has accumulated 7144 runs at a strike-rate of 149.01 with the help of four centuries in T20 cricket. The charismatic batsman will also make two appearances (9 and 10 March) at Gaddafi Stadium in Lahore, the venue where he took a memorable catch to dismiss Shahid Afridi and earn South Africa an ODI series win in 2007. Ian Bell, the top-order England batsman, was snapped up by Islamabad United as their first pick in the draft. 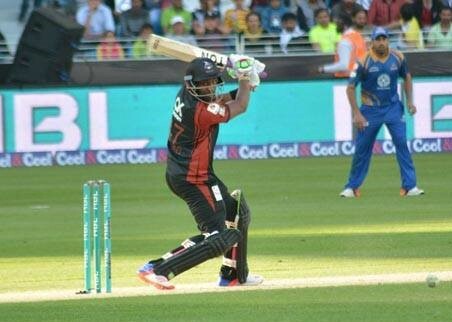 He may have not played a T20I for over four years, but he rediscovered his T20 form in the Vitality T20 Blast in England last season when, playing for Birmingham Bears, he amassed 580 runs at an average of 48.33 and a strike-rate of 139.08. What may have prompted United to go for him was his record against spin – he averaged 187.00 against slow bowlers in the T20 tournament at home. Bell has fond memories of Pakistan as he was England’s top run-getter in the Test series in 2005 with 313 runs at 52.16 including a century in Faisalabad. Karachi Kings retained the enterprising Kiwi opening batsman Colin Munro as one of their Platinum category players before the draft. Munro was part of the Kings’ squads in the previous season as well, but could not feature in the tournament due to national duties. 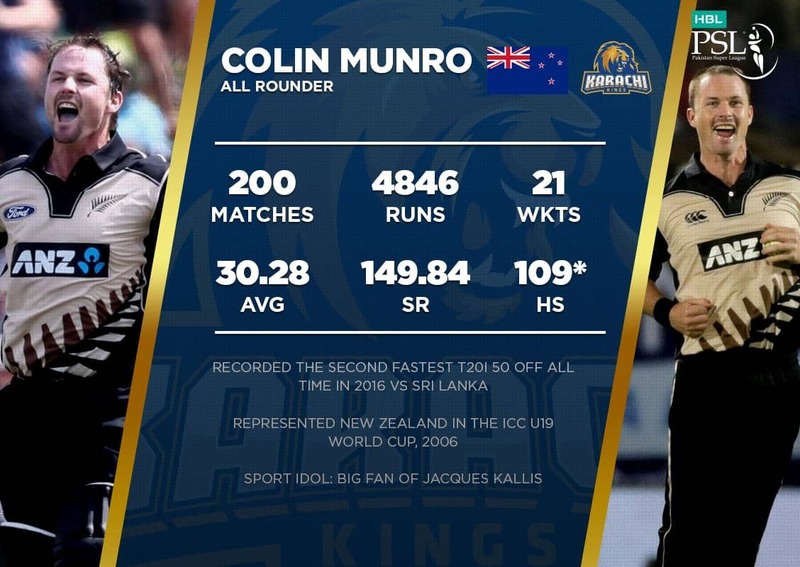 With the world number-one Babar Azam already in their ranks, Kings will have a mouth-watering opening duo once Munro joins the team. The Kiwi opener has highest strike-rate (161.82) in T20 Internationals among those who have at least 1,000 runs. He has also scored four centuries in T20 cricket. Multan Sultans will be the third PSL team of the flamboyant all-rounder Shahid Afridi. 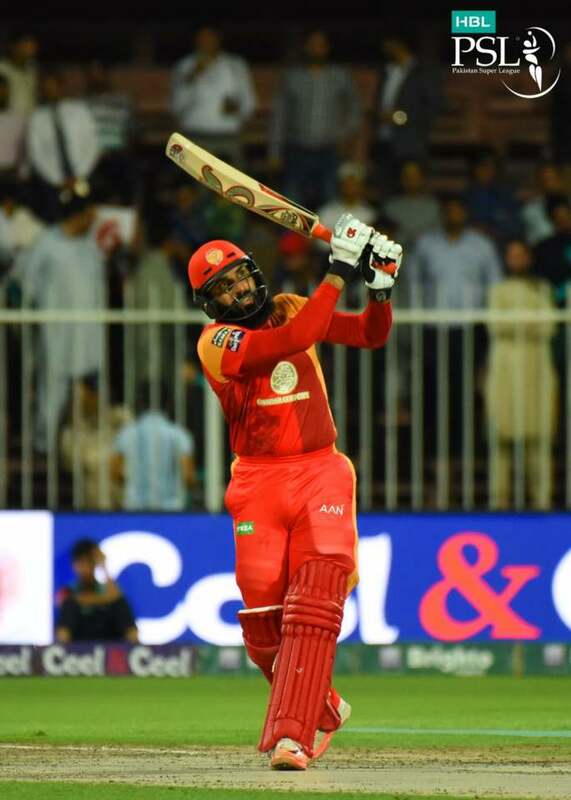 The crowd’s favorite played the first two tournaments for Peshawar Zalmi and third for Karachi Kings before parting his ways from the franchise and going in the players draft. The Sultans captain Shoaib Malik picked him from the Platinum category and will be banking on his T20 experience in the PSL 2019. Afridi has not played a PSL match in Pakistan and the coming tournament will provide him an opportunity to entertain the home crowd. He will be coming in the tournament on the back of a fine season in Bangladesh Premier League. The Boom Boom has taken 15 wickets at an average of 13.33 and scored 123 runs at a strike-rate of 143.02 in the ongoing tournament in Bangladesh. The saying age is just a number fits perfectly on Peshawar Zalmi’s new recruit Misbah-ul-Haq. The 44-years-old batsman was picked by Zalmi from the Diamond category and might will captain them at some stage. Misbah was the mastermind behind United’s two title wins in 2016 and 2018, and has scored 381 runs in the tournament. He has not played a T20 match since the last PSL, but has been an active cricketer in the domestic cricket. The veteran batsman led SNGPL in the final of the Quaid-e-Azam Trophy this season and scored 91 and 44 not out in the final against HBL in Karachi. The most prolific bowler in T20 history, Dwayne Bravo, is back in the PSL after missing two seasons due to injuries. The star all-rounder featured for Qalandars in the first edition and this time will be playing for Quetta Gladiators, who picked him from the Platinum category. Bravo recently captained Trinidad & Tobago to a title win in CPL 2018, the tournament in which he also hit five successive sixes off St Kitts’ Alzarri Joseph. He is also on his way to becoming the first to 500 wickets in T20s. Due to his all-round skills, Bravo is one of the most sought after players in franchise T20 cricket. The PSL will also see him returning to Pakistan after 12 years as he played three Tests in the country in 2006.